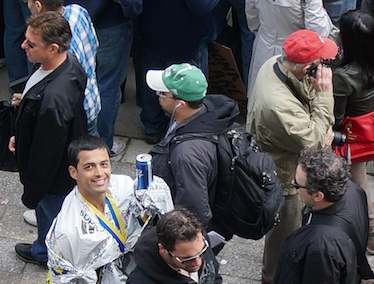 The Boston Marathon bombings may be remembered as the first major news event that truly belonged to Twitter. Within minutes of occurring, the blast had already been GIF'ed and Vined all over the world, leaving newspapers with nothing to do but curate leftover scraps and moralize on the “unique reaction” of social media (and yes, I do see the meta-irony of that statement). But what about the criminal investigation into the horrendous attack—can that be socialized, too? According to Reddit, it can. Only one day after the events, the Find Boston Bombers subreddit was formed to collate and analyze photos of the crime scene, expanding to more than 3,000 users in less than half a day. Some of them had interesting observations to make, others had clearly just watched too much CSI and thought that circling vaguely Arab-looking faces in bizarre diagrams made them super sleuths. The only evidence that the real police had at the time of the subreddit's creation were the remains of one or two pressure cookers and a dark nylon backpack or duffel bag, which has led to innocent bystanders with "saggy backpacks" finding themselves the victims of Facebook witch hunts. This sort of internet vigilantism is clearly on the rise, and it raises a few difficult questions. Questions like, is it really OK to potentially ruin the life of anyone wrongly accused in the pursuit of justice, as in the case of Richard Jewell after the Atlanta Olympics pipe bomb, or the Saudi national only a couple of days ago? As we saw with Eric Twardzik yesterday, even something as innocuous as a misread tweet can permanently damage someone’s reputation when the public wants blood. Or is it an inevitable—albeit not always that useful—democratization of the justice process? I spoke to Rather_Confused, one of the subreddit's mods, to get a feel for this new breed of internet warrior. I guess this is meant to show that a pressure cooker could have fit into that guy's backpack. Doesn't seem very precise. VICE: How did you get involved in r/findbostonbombers? Rather_Confused: I was inspired by all the people who ran straight toward the blast in the video, trying to help out. This subreddit is kind of like that; it’s the human spirit fighting back. So when oops777 [the creator of the r/findbostonbombers] asked me to mod it, I said sure. Do you honestly foresee this subreddit playing an important role in the investigation process? I will say this: nothing surprises me. I’d love to open my computer and read a post that nails the guy. That’s why we’re doing it—in the hopes we can help. Do you have any experience with forensics? No, actually. I’m just a guy. Some people might say that you guys don’t have any expertise and so it’s better left to the FBI. Well, they're right to suggest that us saying “The bomber is this person” is wrong. But here’s the thing: How many times do cops say, “Call our hotlines”? How many times do they ask for help? That’s basically what this subreddit is. How long has your investigation been underway? It started yesterday as a response to what is being called the Where’s Waldo posts on the news subreddit, which are all the posts looking for suspicious people in the crowd at the marathon. It was a way to consolidate those. A redditor demonstrates that a pressure-cooker-sized pot will fit into their backpack, a backpack similar to the one allegedly used by the bomber. And how close are you to getting this guy? Honestly, I have no idea. We could be really close or we could be days away. We know we’re just a small group on a website and the chances of us personally finding someone might be miniscule, but we all want to see the culprits. We want justice for the people who lost loved ones. What kinds of methods are people using? We have hundreds of people scouring photos trying to identify the type of backpack that was possibly used. One redditor put it down to 13 nonwhite men they identified in the crowds. What do you think of soFuckingRad’s 13-man theory? I was actually about to comment on that before you called. We need to be careful about jumping to conclusions—his theory shows that he's clearly suspicious of Arab people. Personally, I wouldn’t want to see any Arab Americans being singled out just because people jump to conclusions. My personal opinion is that they were a group of people there enjoying the festivities just as much as anyone else. What’s the story with Blue-robed Man? There’s Blue-robed Man, White Hat Black Jacket Guy, Blue Duffel Bag Guy (both in the photo below), Green Hat Guy and a bunch of others. Personally, I think Blue-robed Man could just be a guy with bad fashion sense trying to walk through a crowd. For the most part, a lot of these people just look like regular guys hangin’ out, but you never know. I saw your post about this guy. It seems like anyone with a backpack is a suspect—is that right? Well, it certainly doesn’t hurt to be looking at people wearing backpacks around the time of the blast. A perfect example is Music Man: people looked at the post of him because he has a huge backpack, but the backpack doesn’t look like it has any weight to it. If these guys are carrying explosives in their backpack, it’s gonna have some weight to it. It’s basically like a giant game of Where’s Waldo, but we don’t know what Waldo looks like. The thing is—it’s daunting to say—but no one knows who did this. That’s why we need more people looking. A small tip to the FBI could really help. What will you do if you find the culprit? Any evidence we find will be sent straight to the FBI. We don't support vigilante justice, and we don't encourage people to do anything other than report suspects. That's reassuring, I guess. Thanks, Rather_Confused.